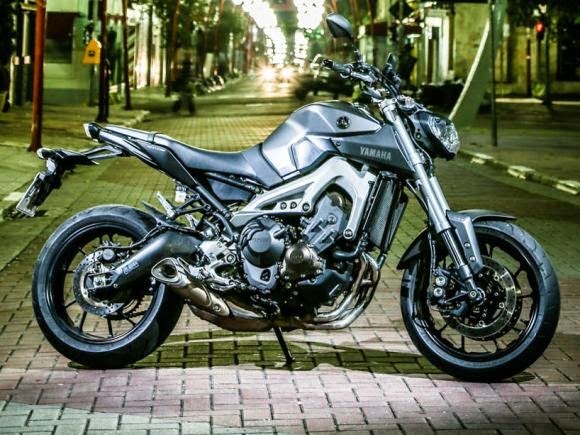 Yamaha MT-09 brings back the riding pleasure. 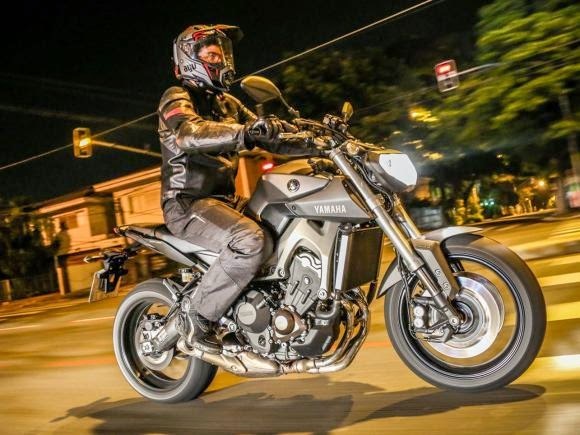 For years, a Japanese motorcycle did not cause such a furor as the new Yamaha MT-09, launched in 2013 and it arrived just in Brazil. With fully differentiated, three-cylinder engine of 847 cc capacity and technical innovation design, the MT-09 became one of the machines more sold in Europe, not only for motorcycle that is, but also for its position in the market. Mainly by not following to the letter the heritage of the first motorcycle family, the MT-01, launched in 1999, which had a visual and sweeping torque, but the set and the price did not like. In the propellant revolutionary, the MT-09 brings some motorcycle-end items. Three driving modes - that alter the operation of the throttle ride-by-wire - frame and weight cast aluminum wheels and sports tires, inverted suspension and monoshock with adjustment in spring preload. According to Yamaha, the MT weighs 191 kg in running order, and has a 51 ° angle, the same average superesportiva brand, the R6. However, this is not the best part. One of its main attractions is its price: £6,799 for the evaluated version, dull gray color and with standard ABS. This places it among their rivals 600 cc and 800 cc, as the Triumph Street Triple ABS and the Kawasaki Z800 ABS, giving you advantage by offering performance "big bike" with price average. For a long time a Japanese motorcycle could not stamp a big smile on our faces, in every situation, whether in the city or on the road. Yamaha, perfectly, used the slogan for the launch of MT-09 the phrase "The Dark Side of Japan" or the dark side of Japan. Honestly, this machine not only awakens the dark side of Japan, but to all who experience the model. Your details only help to support this idea. Starting with the contact of the ignition, which is "hidden" left side of the instrument panel. The rightmost position of the panel leaves the MT with appearance of a "stunt bike", bikes used by wheeling practitioners in acrobatics. The wide handlebar is the best style "streetfighter", which leaves wide open the pilot's arms. 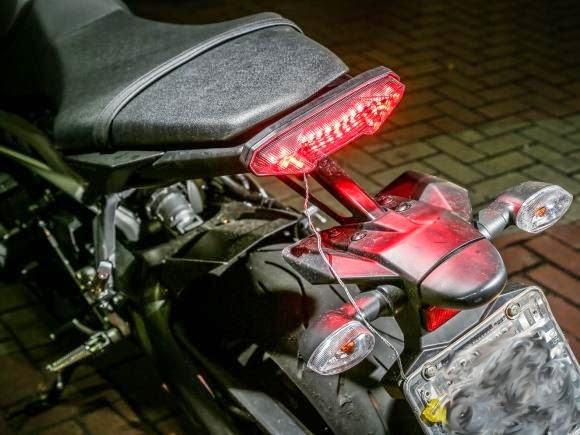 When looking under the dashboard, the driver will not see much of the bike thing, just the top of your headlight, making clear the fierce side of this machine. That alone is enough to arouse the more aggressive side of any pilot. However, it is to turn the key and slide the new button to the key position - a new "switch" like the Ducati - the heart beats stronger. The propellant three-cylinder roars of serious way, unlike other models equipped with this engine type, as the shrill whistle of the Triumph Street Triple. Because of its crossplane crankshaft, technology derived from the World Grand Prix, MotoGP category, and already used in super sportiva YZF-R1 since 2009, the explosion in the combustion chamber takes place in even intervals to 120 ° - a cylinder at a time. Thus, the torque delivery is more linear and benefits the low and medium working groups, according to the company. This is torn off at the first direction, at the "B" (smooth power delivery) YCC-T electronic throttle (accelerator chip controlled by Yamaha) mode. Turning the right handle with ease in both the "standard" as in "A" mode - the power delivery is almost ready - this Yamaha rises. Not intimidating way, but if you are new in the three-cylinder bikes, better watch out. In second gear, the MT still "pulls" too hard early, hence the nomenclature MT, which means "Masters of Torque", or master of torque. 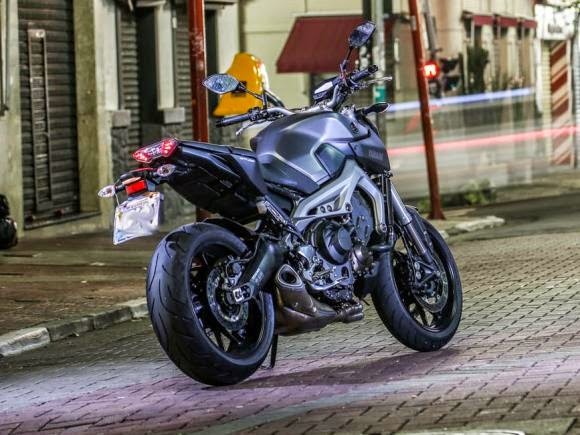 Burn a little clutch in second gear and the MT-09 "comes in the chest." The great and quick throttle response allows you to control it perfectly as the revs go up to third gear. If your skill allows, you can still take it on one wheel to fourth gear, for sure. Need to have courage and "clear path" and money to pay the fines for speeding up the MT-09 in any gear up to the limit of the tachometer. Your engine "grows" very fast and aggressively. 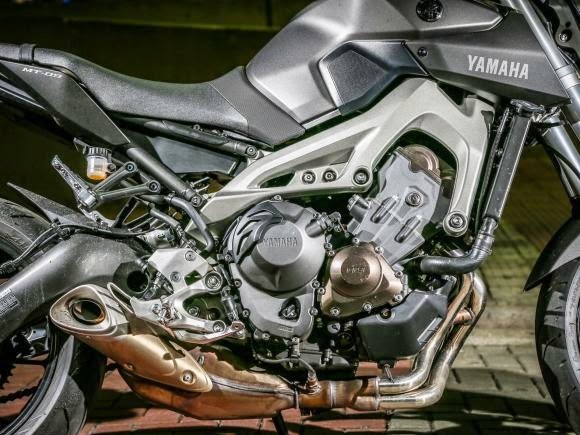 But all this performance and fun have a price: the onboard computer of the Yamaha MT-09 scored a consumption of 7.2 liters per 100 km, that is, an average of 13.8 km / l.
When compared to its direct competitor, the Street Triple, the driver of the Yamaha is a little softer, but is considerably stronger and powerful, with 115 horsepower. 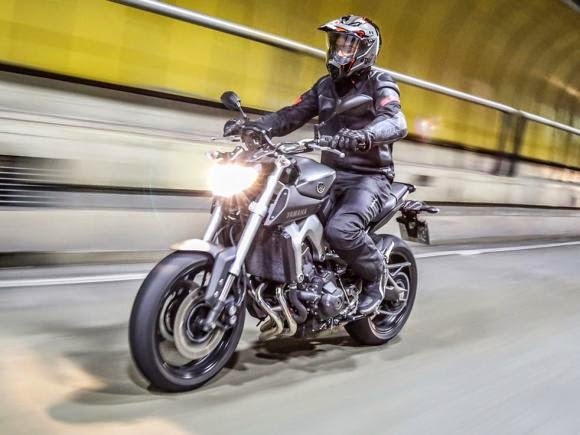 It is almost a mixture of the Street Triple and Speed ​​Triple, with a gearbox six slightly better and more efficient speeds. Among the many good points, I could not say what turns the MT-09 in the most fun and innovative Japanese motorcycle of recent times. But its lightness and agility are, of course, some of these factors. The cycling of the MT-09 is so good that the pilot must have a level head to walk not made a "crazy" in the city or on the road. Despite having a strong touched, the riding position is inviting. Even the less experienced will want to speed up strong. Wide open arms and elbows bent at a slight chest forward and slightly indented and low pedals, leaving the pilot ready to strike a sequence of curves. His suspension set is not the most athletic, especially the factory setting that favors the comfort performance. But offers good performance on the road and also in towns. On the other hand, when it is in "A" of the electronic throttle, the bike is more skittish and more potholed streets, it tends to "bounce" enough if the acceleration is large. Are 137 mm front inverted fork travel and 130 mm of travel in the rear, which well absorb the impact and keeps the bike stable cornering. It's great fun to enter the curves with the MT-09 at supermotard style. Strong come fourth or fifth gear, engage clutch, down to second gear at once and release the clutch slowly while making counter manure results in the rear wheel drag. Despite being equipped with ABS brakes not releasable series, she is still able to provide this emotion to his pilot, which has its dark side touched every minute spent on the MT. The brakes, especially the front - two floating disc 298 mm in diameter with radially fixed four-piston calipers each - is extremely efficient and does not scare even the "alicatadas" stronger. 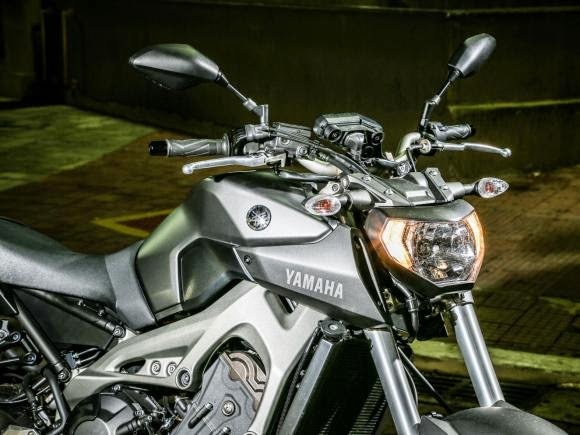 Yamaha fell on hard times and year after year exhibited a "line-up" increasingly no "salt" and rational - with some exceptions, such as the Ténéré family. But anyway the Japanese brand launched a new model to shake and again rock the heart of "Yamaheiros" sleepers around the world. It was time that a Japanese motorcycle did not bring happiness and pleasure to drive as the MT-09. A bike with aluminum frame and scale, inverted front suspension, sports tires, excellent brakes, ABS as standard, three-cylinder engine in line, available from £6,799 in matte gray. A cost / benefit excellent. In a few months, for sure we will see many units of this model through the streets. What kinds of bikes you sell, If you give me information I fell happy. Astounding screenshot! I do not input this setting, but rather I read this post, at that point I isolate my setting and I need some data about including another slide since I am adding to my site item Men's Aviator B3 Shearling Jacket, however, it's some issue with picture sizes and others.